I have to be honest… I haven’t actually MADE anything for my B’Sue Boutiques Build-A-Line Challenge. I’ve been thinking about it, but mostly I have been making other things. I’m not hesitant about what I will be making. I’m feeling pretty good about the designs, though they are very simple. I know I won’t win the judged portion. And I’m okay with that. 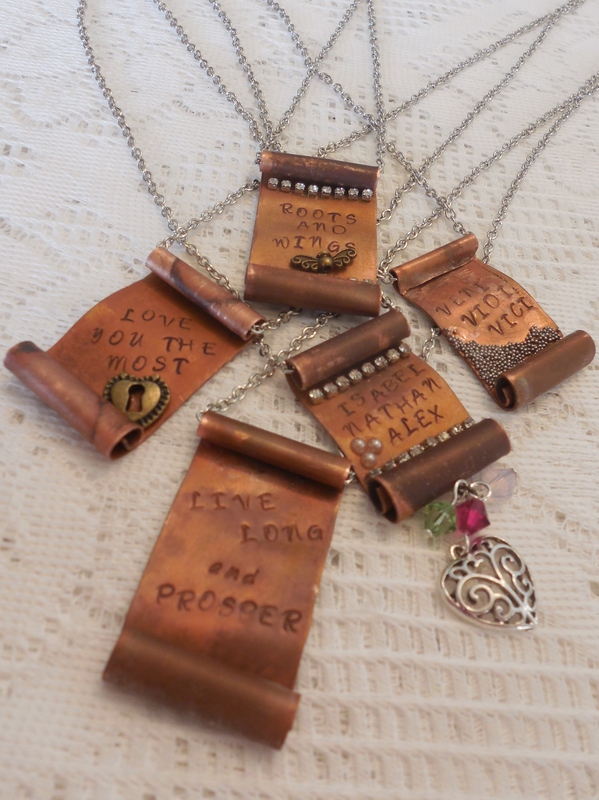 I am learning about building a line of jewelry that just might do that crazy thing… you know, where people buy it. Say Whhaaaaa’??? I know, I might be getting ahead of myself, but it can’t be helped. In our “classroom” we have been talking about what a line really is and what it really means. Basically it boils down, for me at least, to one thing… will people know YOU made it? I don’t know how close I am to that but I really feel that I’m making progress in that direction. I’ve been having a lot of fun with stamps and metal. I want lots and lots of metal in my designs. Hence the stamping. 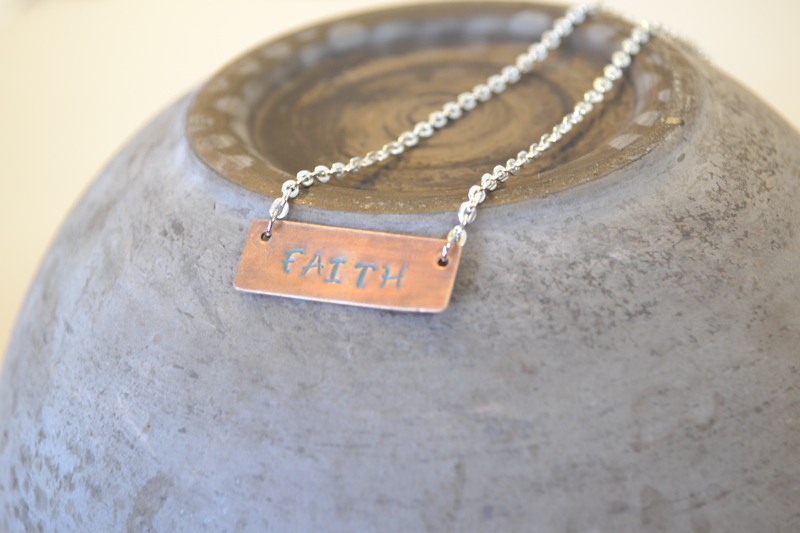 Making pieces that are very gift-able is something else we have touched on. 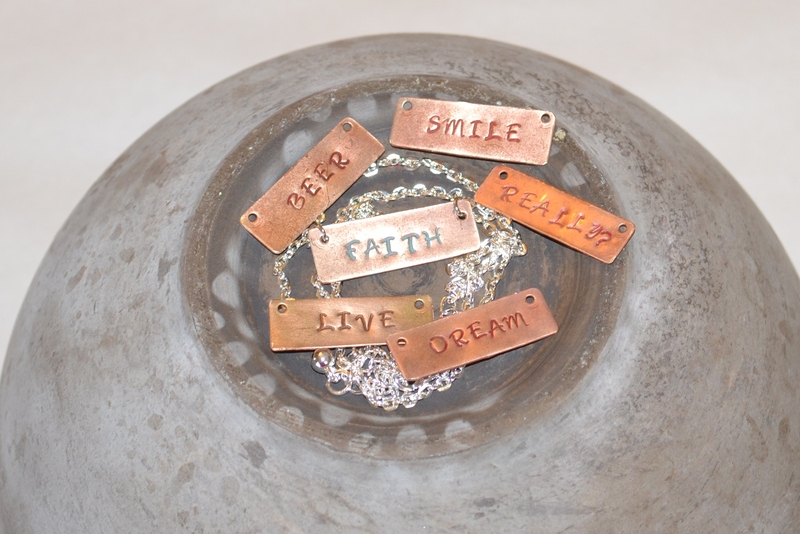 Stamped jewelry is very very easy to personalize. So I’m hoping to take (abundant) orders, while also offering a good variety of ready-made pieces that will range from spiritual to hilarious. I also want to include leather in future pieces. I feel that it fits well with the “western boho” theme for my line. So, leather is a next step for me. I have worked with it some, and was successful, or totally unsuccessful, depending on how you look at it. I made a bracelet a while ago that I was SOOOO excited about. The techniques worked out pretty well, though my riveting needs some work. Really, the only problem was the size. It was way too small. So, it’s not a wearable bracelet, but otherwise it’s just fabulous. 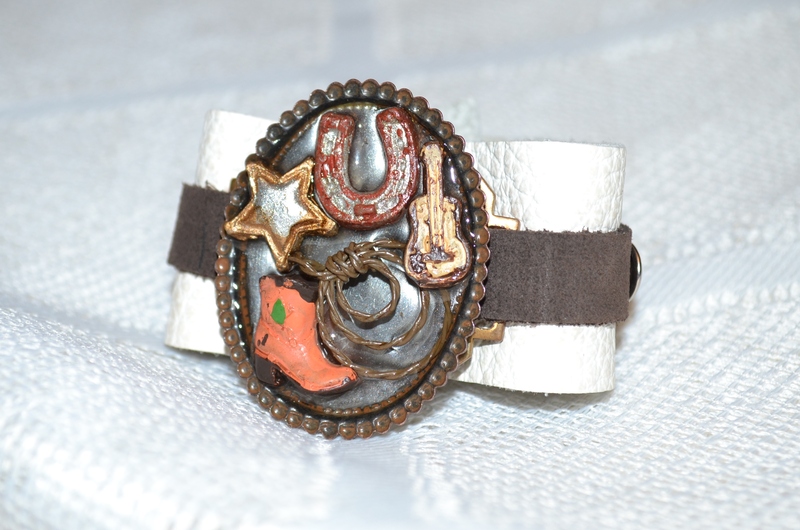 I feel that, while it doesn’t actually “fit” the western boho theme, the stamped metal works WITH the theme. They could be worn together very easily, and it would be a simple thing to add a stamped component into one of the designs that does fit. So I am looking at it as a branch of the western boho tree. I think I am looking at the info coming from the challenge in a slightly different way than some of the other participants. I’m not feeling limited by having a line, and like everything I create now must fit into that category. I’m thinking of my line as the central concept that other things can branch off of. I have an idea for a second branch of my tree, but it’s going to have to wait a bit until I make a bit more progress with my current projects. But the idea is there, and it will stay, I have a feeling. And really, there’s nothing wrong with growing a whole new tree… As long as people know it is YOUR tree.